My passion is sharing Flinders Island life, hosting guests, telling the stories, valuing and creating meals using produce from Flinders Island to honour the environment, the seasons, and most importantly, my guests. 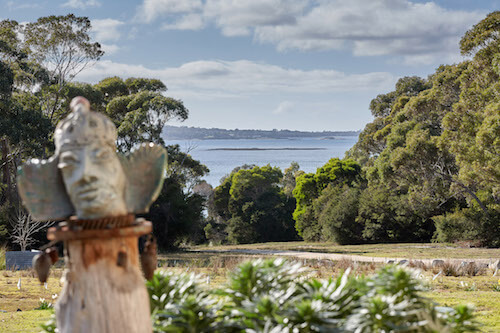 In this new venture, I have returned home to manage our Flinders Island accommodation to provide what I do best, high end catering and accommodation in a remote and beautiful environment – one of the best kept secrets in Australia. Our recently refurbished rooms offer different options to cater to your needs and tastes. The spaces integrate the old with the new. Wine bottles become jewelled green and blue light. 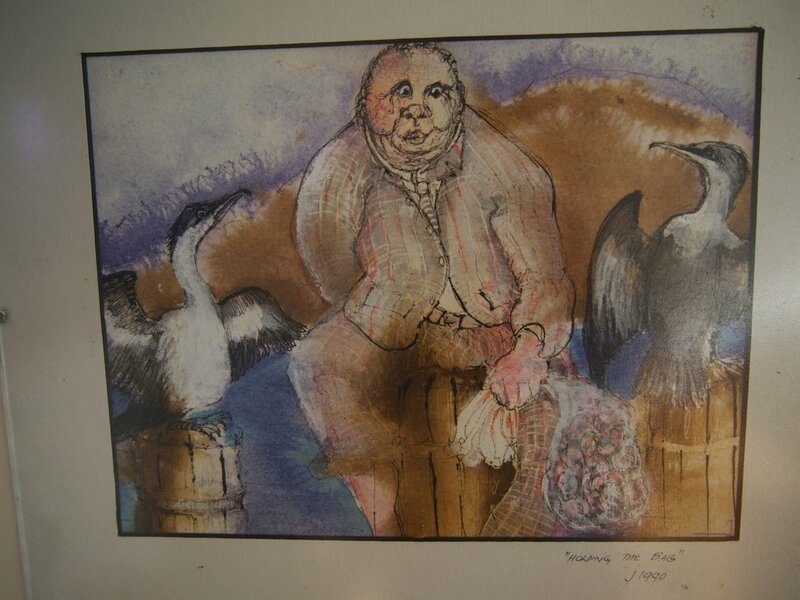 Local trees have become furniture and feathers from mutton-birding have become cushions. You are welcome to look at our rates terms and conditions, situated at the bottom of each of these pages. Parkavee was the name of my parent’s farm at Memana. 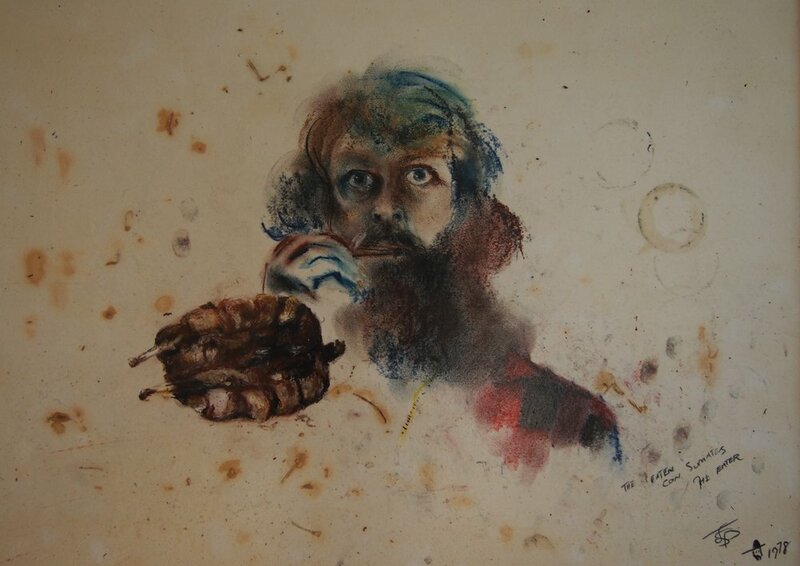 Dad was a Korean War Military Medal recipient and was a pioneer during the Tasmanian Agricultural Bank’s Soldier Settlement Scheme of the 1950’s. We are proud to offer this queen size bed in a room with a wide cedar door opening straight off the veranda. This is an all access room - suitable for wheel chairs and walking frames. The en-suite has non slip mats for general use. The Emily was a graceful little wooden boat, built by the Robinson’s of Badger Corner and bought by my Dad Tom to go to Long Island and fulfil the weekly mail contract to Cape Barren Island. It was mostly moored at Badger Corner but is pictured here at the mouth of the Samphire River. Tom was the last contractor to take the mail and supplies by sea; now it goes by light plane. The Emily Room has a queen size bed with full length sliding door overlooking the bush. The en-suite has a separate toilet and bathroom. Badger Corner is so named because the settlers after 1788 thought wombats looked a bit like the badgers of England. Wombats are not at all like badgers but they are social - and the bunk room is the same sort of shared space. The old school room map hangs there, showing us how things have changed. 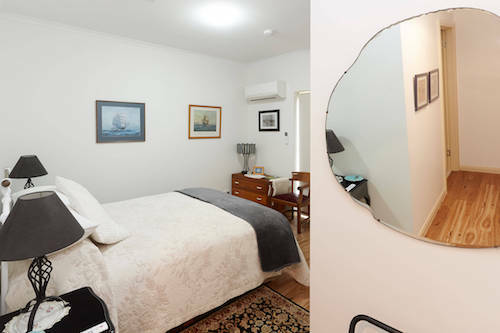 The Wombat room has single bunks and guests use a nearby bathroom. Each morning, the eastern sky gives glimpses of islands and bays in the Franklin Sound. 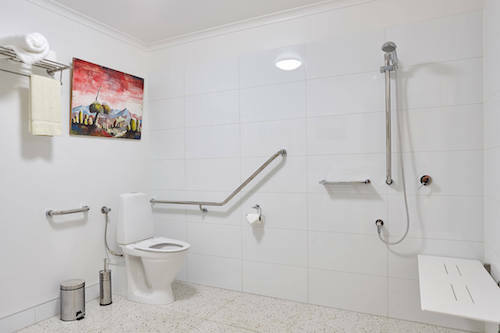 There is a spacious walk-in shower, separate toilet room and a brightness in the en-suite. The early light in this suite has a topaz hue. Topaz, the third hardest stone on the Moes scale of hardness, can be found on many beaches and creeks. It was mined around Killiecrankie and is commonly called the Killiecrankie Diamond as a result. The long king bed heads are made from a black-wood tree I had milled from the property. I designed them to face the wonder of the dawn. Short Tailed Shearwater, Petrel, Muttonbird and Yolla or Moonbird - all are names for one sea bird that flies down from the Northern hemisphere each year in numbers too great to count, to breed on the islands in the Franklin Sound, returning to the same burrow each year where they’re snug and protected in the tussocks. 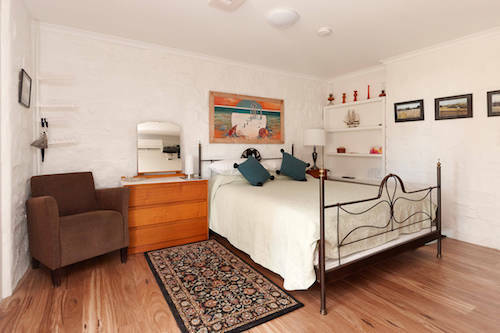 The Moonbird Room has a light filled en-suite with separate toilet room and a cast iron bed head on the king bed. It is a place to feel safe and snug. As a child growing up on Flinders Island, I would find pieces of smokey quartz on the gravel roads, along creek banks or on the beaches. This room is named for the drama of the western sky. If it’s not a spectacularly coloured sunset with orange silhouetting the trees, or washed out in pale yellow, then it will be a smokey quartz sunset with whites tinged with browns and blacks and greys, pushing out from Riddles Hill. 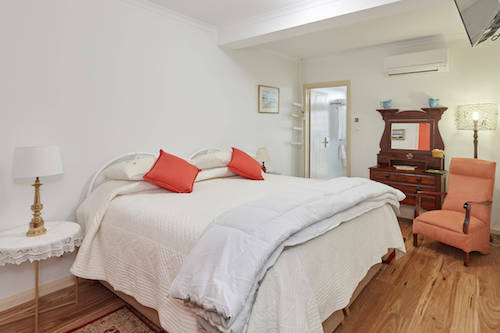 This room has a long king bed and the en-suite, like the others, is full of light and also has a separate room for the toilet. The pine ‘thrones’ and six chairs around the pine table in the outside studio were hand crafted by artist John Parish. The bar originated as a 1970‘s school library desk; the dresser and hutch came from the same place. This space is ideal for sheltered outdoor meetings with views to the sea but also used for au plein air art and special theatrical dining experiences - or just a cuppa. 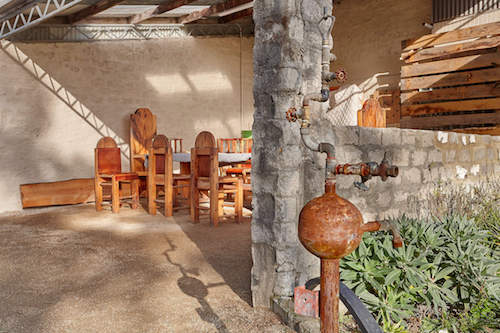 The north facing Courtyard with fire pit has been a place for many years where I have invited locals to barbecue their food and share a salad and dessert. Named because the pot can boil on the barbecue but also the roaring of the Pot Boil (where the tides meet) which can be heard and seen from Cooma House. This space is warm, sheltered and the place for story telling around the fire. This is a newly created space. 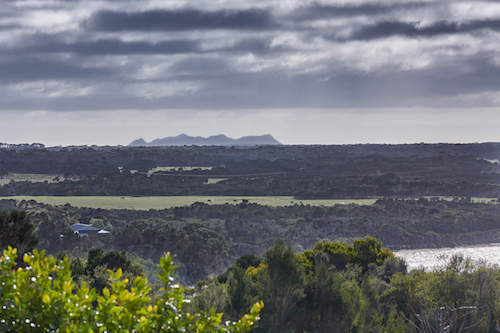 On most days there is a clear view to the North, up the East Coast where the crags of Babel Island, including the Lion’s Head, are visible - a rarity from Flinders Island. In September, you’re surrounded by flowering bulbs but for the rest of the year, it is the best place to feel the air move or to see and hear the Pot Boil where the tides meet in the East. 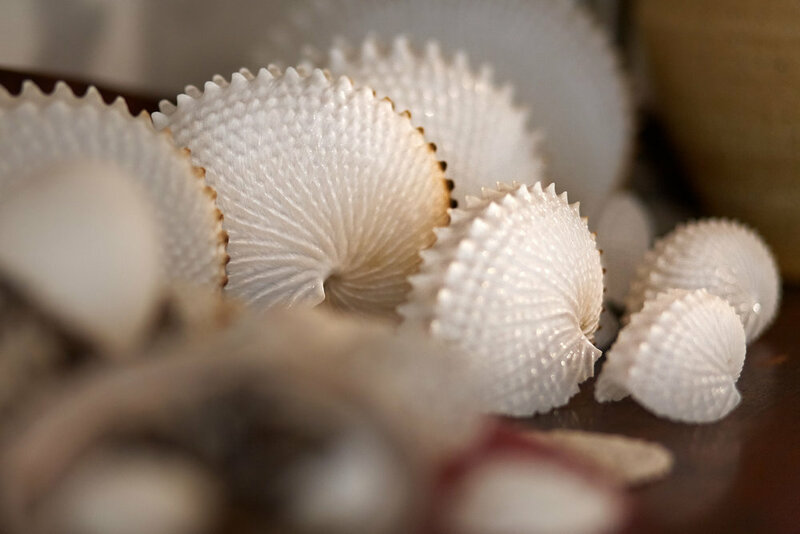 The Labyrinth is a nautilus shape, designed along the principles of the golden spiral. It is also designed to enable a connection to our spiritual side. 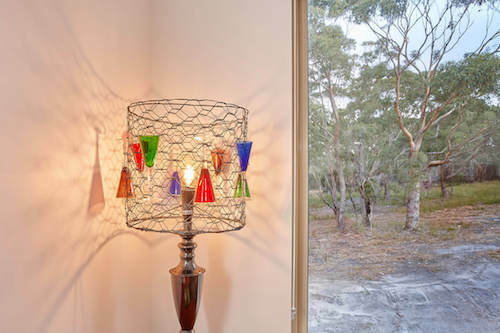 In line with the ideal of using what we have and having what we use, the pathways of the labyrinth are delineated with glass bottles upended, jewelled in the ground. Let the world go by while the walk is experienced and all becomes aligned. A space for mornings and beginnings - where the early sun teases us whilst we are sitting at the tables, talking, feeling the day and looking out through the sculptured bush and trees to the islands - or straight across to the town of Lady Barron. Enjoy a leisurely cuppa, served in beautiful cups, a talk and a laugh; you’re half outside and half not. This sitting room is overseen with a self portrait by the artist John Parish who built the original house. He also made the chairs and tables in this room from a tree I used to play on at the Riddles of Badger Corner. The cushions are filled with mutton bird feathers. 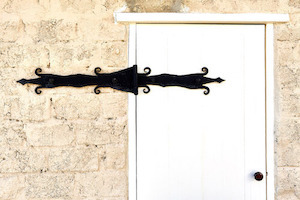 It is a good space for succession planning or just a snug meeting place, especially after a meal or a day out - or to make a coffee or tea for your room. Our rates are based on an irrevocable fact - in remote and wilderness areas you have your meals provided because in isolation and beauty, your choices for other catering are as remote as our wonderful wilderness. A double room is $250.00 per person per night with a minimum stay of two nights. 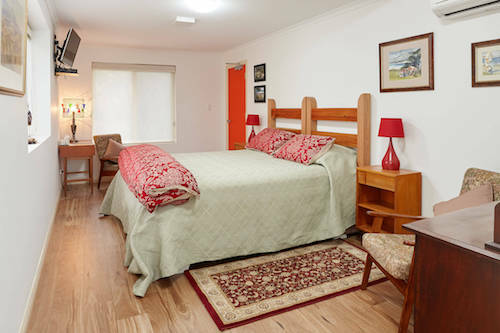 A twin room is $300.00 per person per night with a minimum stay of two nights. A sole use room is $350.00 per person per night with a minimum stay of two nights. Each room is named. 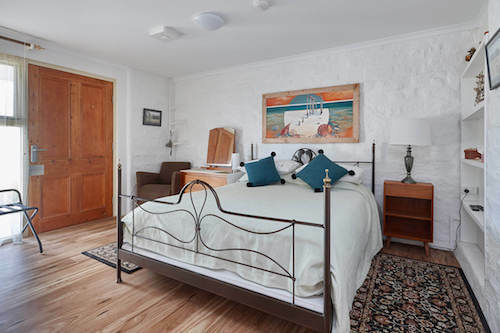 You can see each room and its story on the accommodation page here. Artisanal seasonal Menus are available on request. 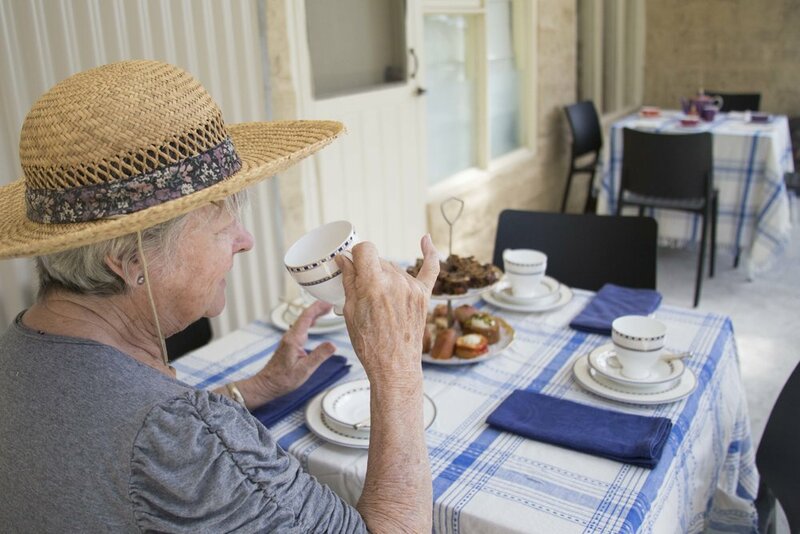 Non residential guests visiting Cooma House for morning and afternoon teas are $25.00 per person for groups up to 20 guests and include a tour of the kitchen garden. Duration of visit 1 hour. dinner, three courses from $80.00 per person served at the Cooma House Premier’s dining table. By making a booking it is understood that you have read, understood and accepted our TERMS & CONDITIONS . A booking is made with a 50% deposit, the balance payable and cleared funds visible, two weeks before arrival. A booking is confirmed once a deposit has been acknowledged. For each booking, there is a minimum stay of two (2) nights. Christmas and Easter are a minimum stay of four (4) nights. 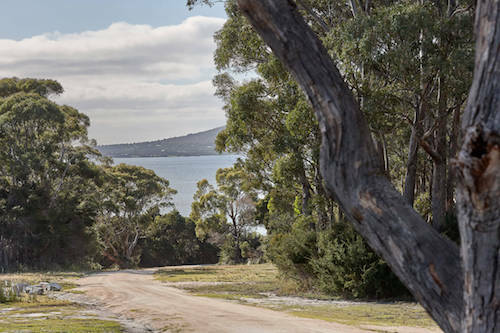 Enquire now about our Flinders Island accommodation. Access our rates terms and condition here.